The spoken language , in its various intonations, will immediately signal to you the nature and sincerity of a statement. at the very worst you will receive 'sorry xz?w8hjfk!;!!!!!!!!' (fill in the blanks yourself). However, any form of written text is a bit more complex to dissect, to tweak out the hidden deception and half-truths - to look beyond the denotations of language to the connotation. And of course the insertion and placing of images in the text and layout of any print and electronic media can be used as a subtle and clever type of innuendo and insinuation. ,,,,,,,, was recently caught - with its 'kn.....rs in a twist' ( not the first time though) with this front page "scoop" . It could only lead to the inevitable anger and disgust from the Malay-Muslims ( the bumiputra and 61.3 percent of the population). Conflating terrorism with an image of Muslims at prayer is quite unforgivable and cannot be anything else but mischievous. The management and editors at all levels of authority in The Star cannot claim that it's due to ignorance or an innocent 'coincidence'. The pathetic and self-serving apology that followed made matters worse. And so, after that headline and the limp apology, can we declare "Three strikes and you're out!!" ? How pathetic is this sorry state of an 'explanation' ? Paragraph 3: Nobody but a cretin would not link the message and intent of the headline and the picture. Do the powers-that-be in The Star think so little of the Malaysian public's ability to assess the carelessness and callousness of the design of that front page? You don't need a degree to recognize the malice, whether it's intended or not. This reminds me of the excuses put forward by the owner of Ninja Joe P. Ramly Burger when he was brought to task by the owners of Ramly Burger. So, 'P' stands for pork in Ninja Joe's P. Ramly burger!! What a porkie! Or maybe this is just an unfortunate coincidence - a similar plight to The Star. Paragraph 4: "The Star should be more discerning and sensitive to the feelings of our Muslim readers". What an unfortunate oversight! Or was it? Would some of The Star's readers be irate if this collage appears on the front page of "Malaysia's No 1 Local English News Portal". Here's an extract from the third image at the bottom.
" The urban areas - especially the capital Kuala Lumpur ......... George Town, Malacca and Petaling Jaya enjoy a quality of living very similar to that in developed countries. However incomes are still distributed unevenly. For instance the wealthiest 20% of Malaysians control 53.8 per cent of the wealth while the poorest 60 per cent of the population controls just 21.3 per cent. .............. Disparities exist along both geographic and ethnic lines. 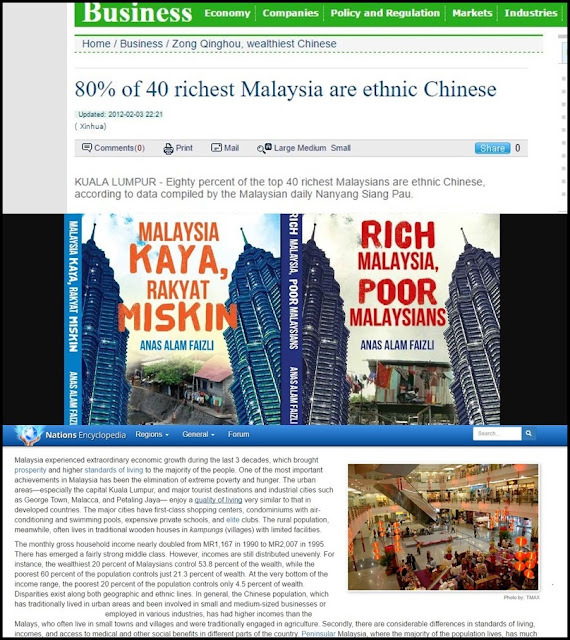 In general, the Chinese population, which traditionally lived in urban areas and been involved in small and medium-sized businesses or employed in various industries has had higher incomes than the Malays,who often live in small towns and villages and were traditionally engaged in agriculture. .......... Peninsular Malaysia, where the majority of the population lives, has much higher standards of living compared to East Malaysia." Being discerning and respectful of people's sensitivities has always been a commendable trait in this country that gave shelter and sustenance to those who came to her shores for the last 250 years. But standards of respect for our differences have fallen drastically - thanks to the Internet, Twitter and Facebook which allow neanderthals and cowards to flaunt their bigotry and double standards. I recall these recriminatory words from Dato Seri Wong Chun Wai, Group Chief Editor of The Star in his column when he challenged the rantings of a Malay racist group. In the fourth paragraph of his column, Dato Seri Wong wrote " Obviously, it needs to be reminded that under the definition of sedition and seditious tendency in our legislation, anything uttered which upsets a group of people along racial or religious lines is seditious. The term may be broad but that's how it goes, people. " Exactly! That's how it goes Malaysians!! Especially when and if you believe that "you belong to Malaysia" and not the proprietorial "Malaysia belongs to us/me". Finally, here's an item from the venerable New York Times which is very similar to The Star's star headline. 1. A few days ago I came across this article in The Guardian which complements the issues that arose from The Star's 'unfortunate coincidence' of May 27. Extracts from the article will do a better job at making a comparative analysis of the journalistic style of The New York Times and The Star. With apologies for the poor image. News about lies and robbery committed by white swimmers representing USA during Rio 2016 (compare with Malaysian terrorist leaders in The Star) was conflated with that of Usain Bolt's remarkable victory at Rio 2016 (compare with image of Malaysian Muslims at Terawih prayers in The Star). .... or Prejudice and Pride?